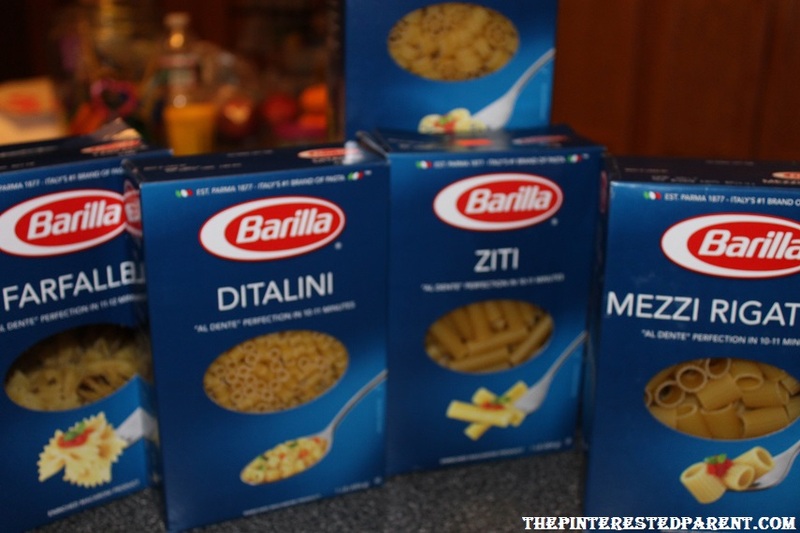 Is it weird that I have 8 boxes of pasta in my house designated only for crafting? I have more pasta for arts & crafts than I do for actually eating. I love pasta crafts. It is so much fun to work with and it comes in so many varieties & shapes. You can paint it, string it together & glue it. They are so many possibilities. 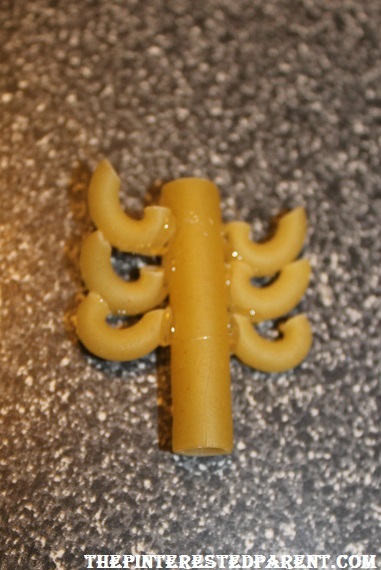 Taking one of my daughter’s suggestions, we made some pasta monsters too. While Mai painted the jumbo shells for the monsters, I started to string & glue the skeleton together. 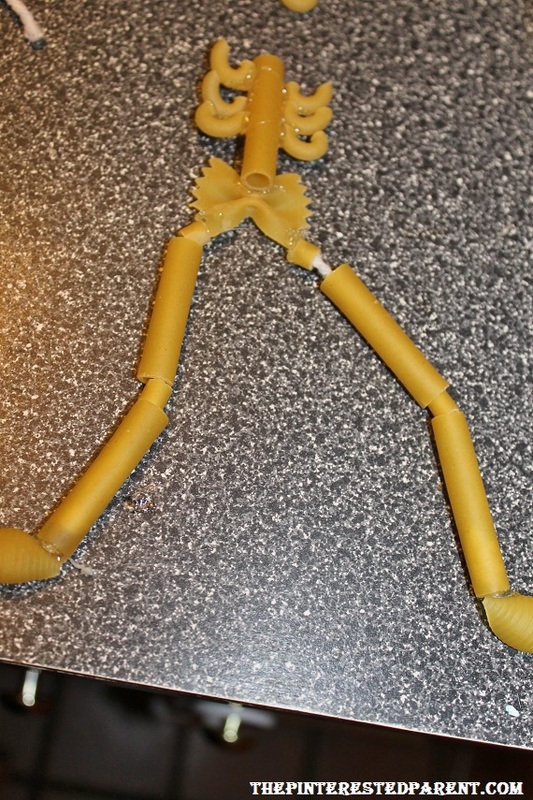 Use a piece of yarn to string up 2 pieces of ziti with 2 pieces of Ditalini between them. Tie a knot on each end. 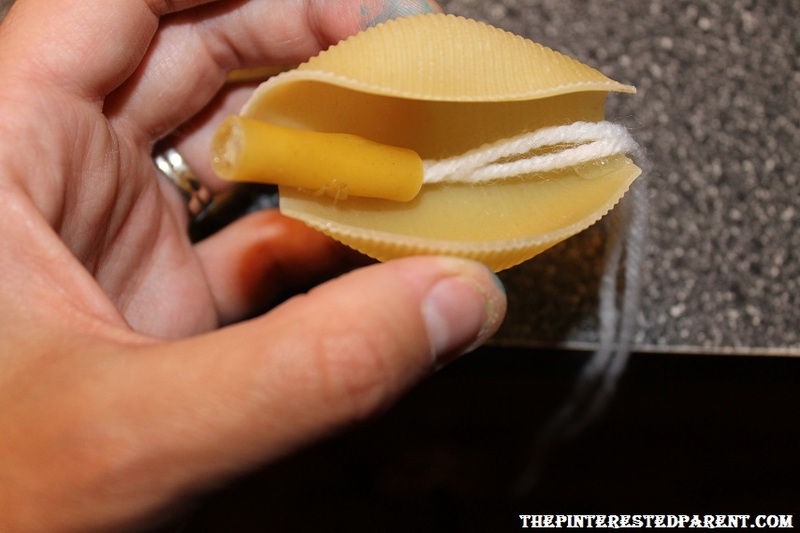 Press the glue gun into each end & push the knot into the pasta & insert glue. Make 3 more exactly like this. You will need 4 total for arms & legs. Take two of the pasta/yarn strands. Glue a small shell to the ziti end of each strand. 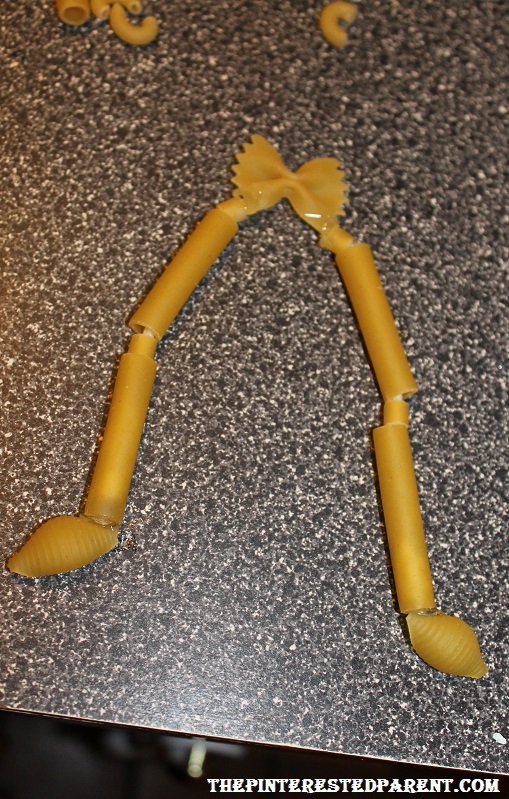 Glue one piece of farfalle to each strand using the ditalini end. 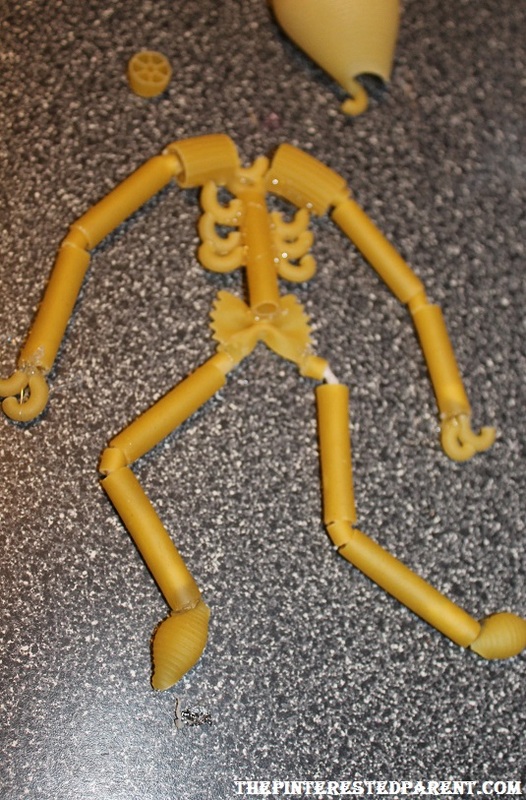 Glue 3 pieces of elbow macaroni to both ends of a piece of ziti as shown to form the rib cage. Glue the rib cage to the center of the farfalle. Stack two elbow pieces to the top of the rib cage and glue into place. Place two rigatoni pieces on either side of this. From the ditalini side, glue the other two pre-made strands to the rigatoni. Glue two elbows to the bottom of each arm. Fold a strand of yarn in half. Insert both ends into one piece of ziti & knot off on the end. 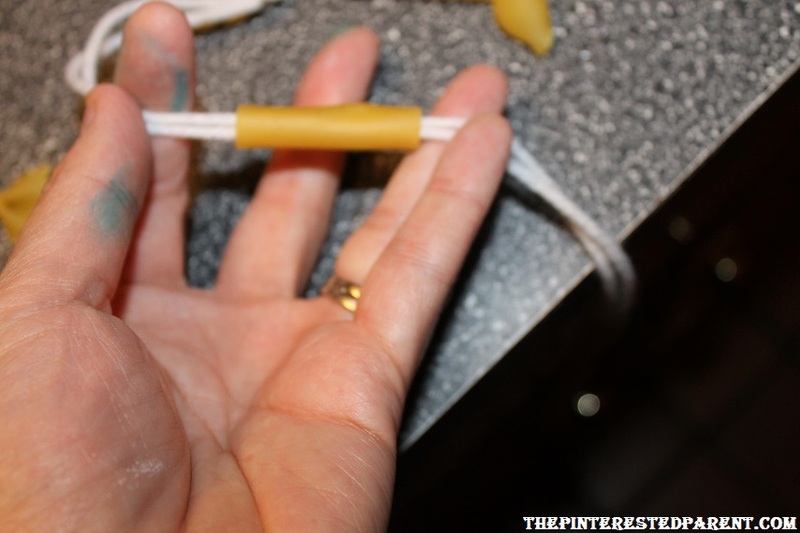 Push the knot into the ziti with glue gun & squeeze a drop of glue on each end of the ziti. Glue the ziti inside of a jumbo shell with about a half inch of the ziti sticking out for the neck. Use a drop of glue to secure the yarn strands on the other end of the shell. Next we were on to our monsters. 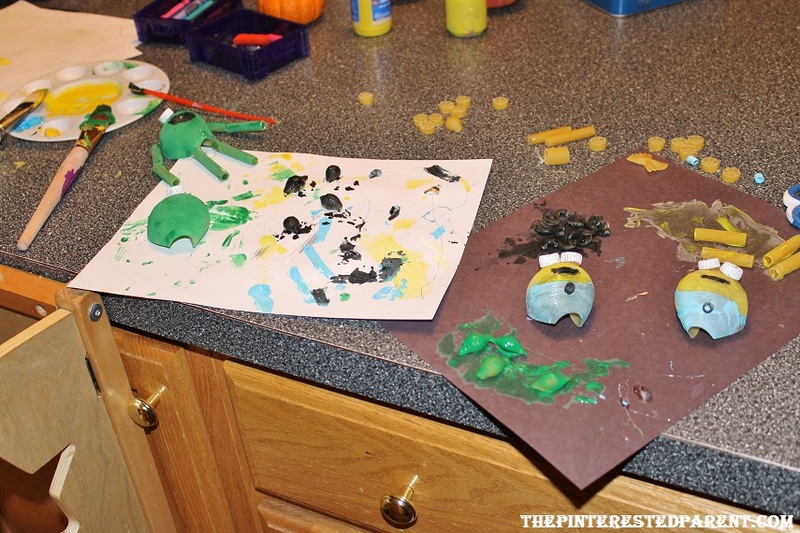 Mai & I made quite a mess as we painted our pieces for our monsters. Directions: These are directions to make one minion. Paint a jumbo shell & two pieces of ziti yellow. Paint two wagon wheels white with a dot brown in the center. (We used blue, because Mai wanted blue eyes.) Paint two small shells & one ditalini black. Let the paint dry. 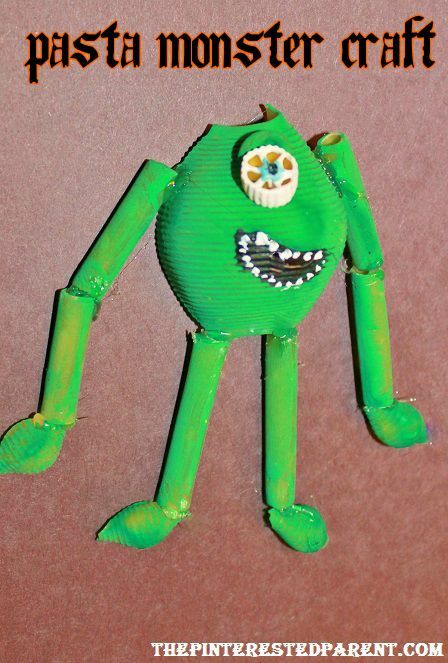 Use the glue gun to glue wagon wheels in place for the eyes. 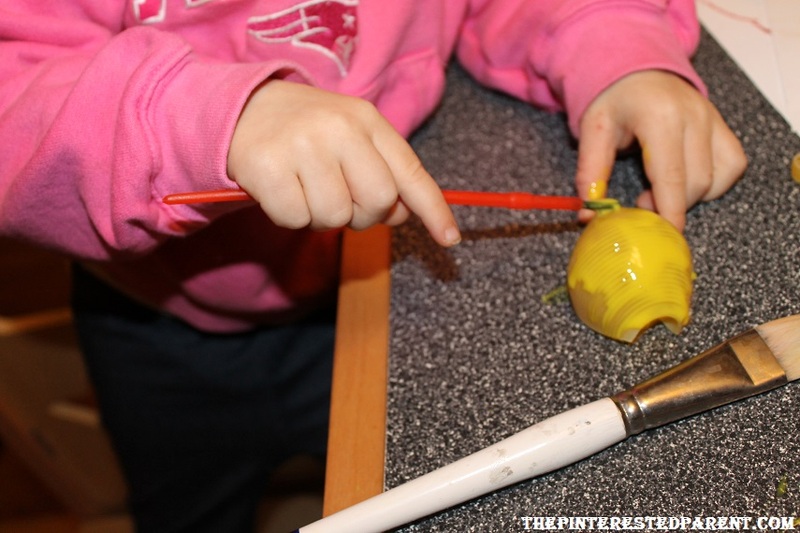 Use black paint to paint a thick line on either side of the wagon wheels so that it looks like goggles. Paint in your mouth & teeth using black & white paint. With blue paint, paint the bottom 3rd portion of your minion. Paint a thick stick of black around each yellow ziti piece. Let dry. Glue the ziti to the sides of the minion to make arms. 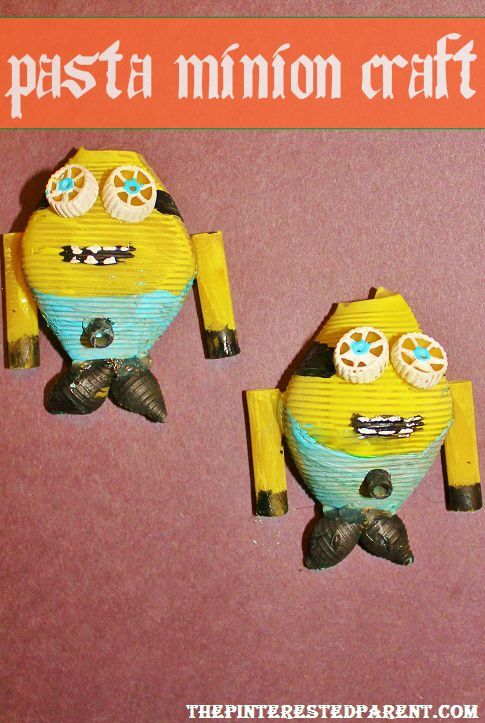 Glue the two small black shells to the bottom of the minion to form feet. Glue a black ditalini in the middle of the blue painted portion of the minion. Paint a jumbo shell, 6 ziti pieces, 1 elbow macaroni & 4 small shells green. Paint one wagon wheel white. Add a blue circle in the middle & then a black dot. Let dry. 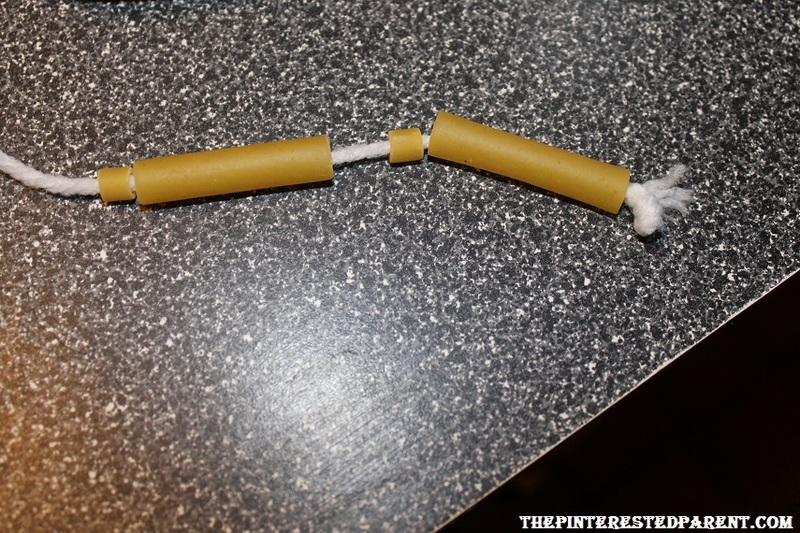 Glue the ziti arms in place using 2 pieces on each side. Glue a small shell to the end of each arm to form a hand. Glue two pieces of ziti in place for the legs & then add the small shells as feet. Glue the wagon wheel eye in place & then add the elbow macaroni over the eye to form an eyelid. Paint in a crooked mouth with black paint & dot with white for teeth. Let dry. Thanks as always for reading. Please follow us on Facebook. Mai is sick today, but still wants to do more. She asked to make Sully monsters today. Lol! Love it a must share, hi Mai!!! Thanks Mari! Mai says hello as well. fun, fun, fun! Great creativity happening over at your place! 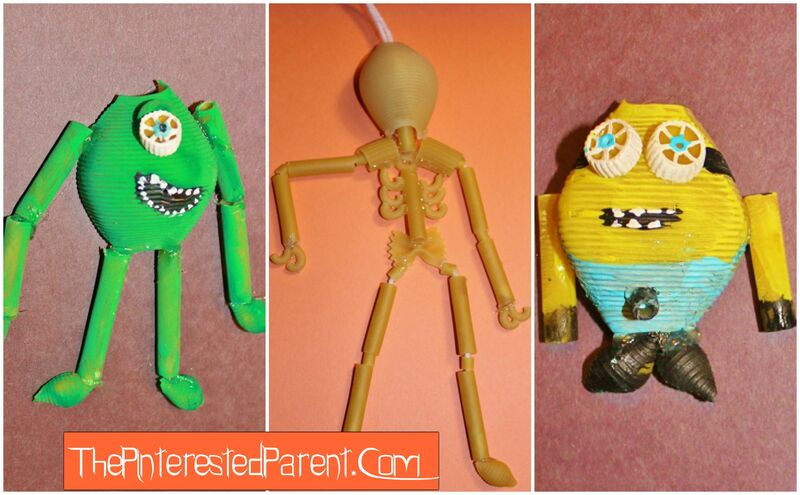 I absolutely love these – so clever – I especially love the skeleton! so cute what a great idea! What a great idea! I love the skeleton. When I taught Kindergarten, they would have loved this. I’ll keep this in mind as my son gets older. Thank you, Tricia. I love playing with the pasta. I swear I am a big kid.